Great news from Craig Frith that we have an extra lecture for the Sheffield Circle’s current lecture series: Andi Gladwin will be presenting his brand new lecture on Wednesday 26 October. Andi is cofounder, with Joshua Jay, of Vanishing Inc. Magic. 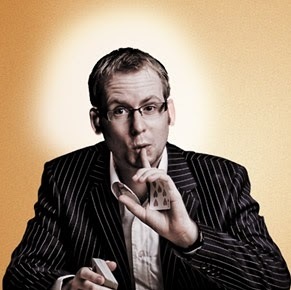 He specialises in card magic, and has released two highly regarded instructional DVD sets on areas he is an expert at: the multiple selection and the multiple pushoff. His Master Pushoff DVD received rave reviews in every magic journal. With over 15 years of performing experience and a wealth of knowledge about the magic industry and history, we are absolutely delighted to have Andi Gladwin join us. Andi’s sleight of hand is second to none and his magic is world class (he was the only UK magician to perform at President Obama’s inauguration in 2013). The lecture is at 7:30 pm on Wednesday 26 October at The Magic Lounge, 82 Broad Street, Sheffield, S2 5TG. Doors open at 7:00 pm with the alacrity born of efficiency and experience.Admission is £5 to Sheffield Circle members, £10 to visiting magicians. Join us and get ready to have your magic be forever changed.